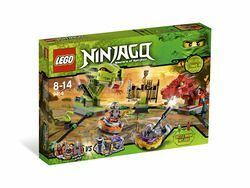 9456 Spinner Battle is a Ninjago set released in late 2011 in the US and 2012 in the UK. It includes Kendo Kai, Rattla, their two spinners, a snake staff, and a battle arena. On the January 2012 US Catalog, this set's title is "Spinner Battle". However, on the LEGO Shop page for this set (see sources below), it is titled "Spinner Battle Arena'". This set is the only Ninjago 2012 set so far to have the same minifigures as another set, meaning Kai and Rattla who are also from set 9441 Kai's Blade Cycle. However, Kai is Kendo in this set, and 9441 has him ZX. This is the only set other than 7326 Rise of the Sphinx to have a gold Egyptian sword. The snapping snake heads in this set are shown in Spinjitzu Spinball. The set was going to be called "Snake battle", a name which went to another set. The set wrongly labelled Rattla as Slithraa. Kendo Kai is the only kendo ninja to not come in a non-spinner set. Facts about "9456 Spinner Battle Arena"
This page was last edited on 24 April 2019, at 08:23.